This tree is located on 24th Ave.S. just north of its intersection with Vanderbilt Place. It is in front of the Beta Theta Pi house. 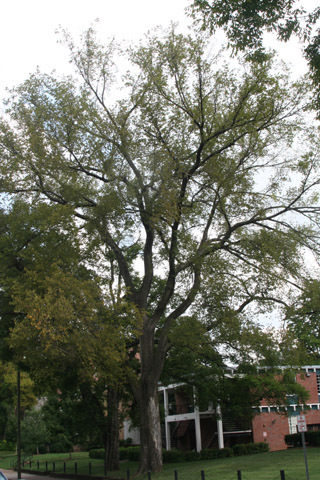 Big elm trees like this were once a common site along streets in many cities in the United States until the Dutch elm disease wiped most of them out in the mid-1900s. Thanks to careful pruning to prevent the buildup of dead wood, many of Vanderbilt's elms have survived, including this giant. This organism is a living specimen that is part of the  Vanderbilt University Arboretum  with the local identifier 3-589.